What is IT4IT, why has it become so popular and how can IT4IT training help businesses boost the value of their essential IT processes? Mike from Good e-learning takes a look at the story behind the renowned reference architecture for IT management. Contact Good e-Learning today to find out more! IT has become much more than a mere tool for businesses to make use of. With the growth of the internet of things, the widespread use of online advertising and changes to the general expectations of customers, IT has become an essential part of modern enterprise; one that needs to be made as streamlined, well-structured and effective as possible. This is where IT4IT comes in. The prescriptive and vendor-neutral reference architecture was developed by The Open Group, the organization behind TOGAF and ArchiMate. It is designed to help businesses to reduce the costs of IT while also simplifying key processes and providing end to end traceability for IT production. Unlike other reference architectures, IT4IT goes beyond the operational side of IT; it also focuses on IT product planning, design, creation, defect detection and more, essentially treating IT as a production-based business in itself. 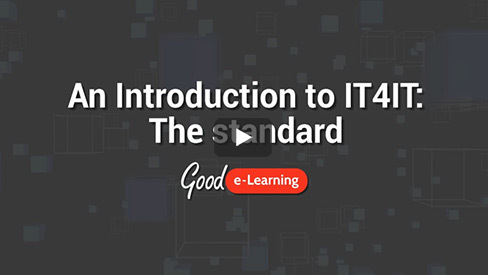 In this video, Mike from Good e-Learning takes a look at the story behind the development of IT4IT, how it works and how it can benefit businesses. Good e-Learning offers a range of Digital Transformation training courses; both our IT4IT Foundation course and the IT4IT Foundation & Awareness Suite lead to recognized and highly-valued certifications. Our online courses can help students to boost not only the value of their IT services, but also their own earning potential.